Nice solid guitar. No cracks, shows signs or light use, but still in excellent shape. Below is some information on this model. Amber in color and with brand new soft gig case. No blemishes on guitar. The top range of acoustic guitars market is usually perceived as an arena where a handful of brands compete for the first place. While that is generally true, you will frequently see exceptions to this unwritten rule. Underdogs will rise and shake the foundation of this high class to a point where you really need to ask yourself just how set in stone is the scoreboard? 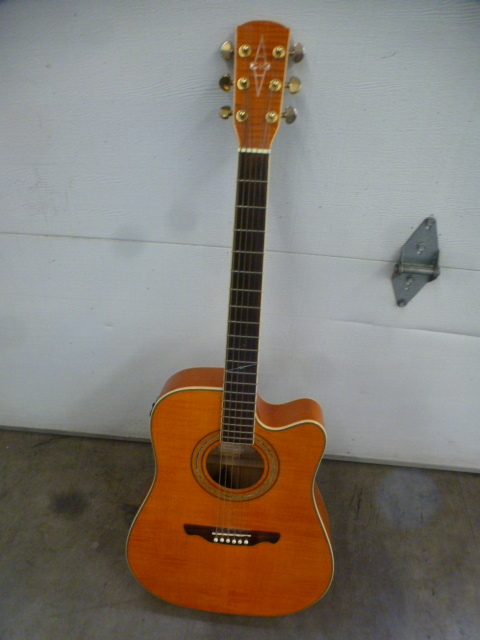 Alvarez FD-60 is one such guitar that has a lot to offer to those who are willing to look past the brand name. For under a grand, this is one of the best buys at the moment. Let’s find out why. If it ain’t broken, don’t fix it. That seems to be the idea behind this guitar. Alvarez went for the most popular body shape, which is of course dreadnought, and added a cutaway for easier access to the higher notes. 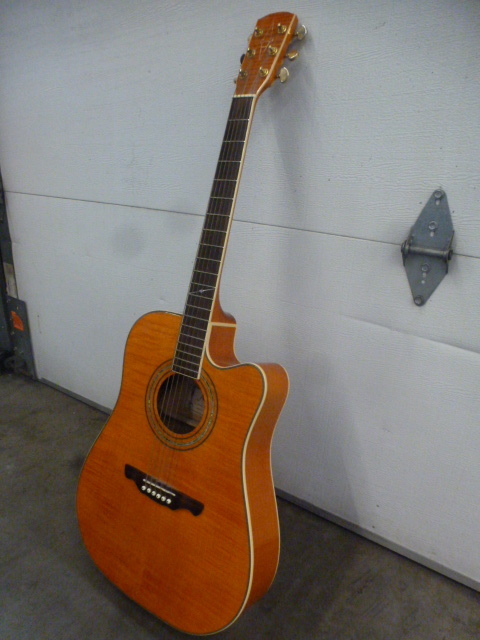 The guitar is made out of maple all around, including a finely quilted maple top. Along with the fretboard, this top features nice white binding that adds a great contrast to the texture of the maple. Build quality is pretty much on point, with every detail polished out to perfection. 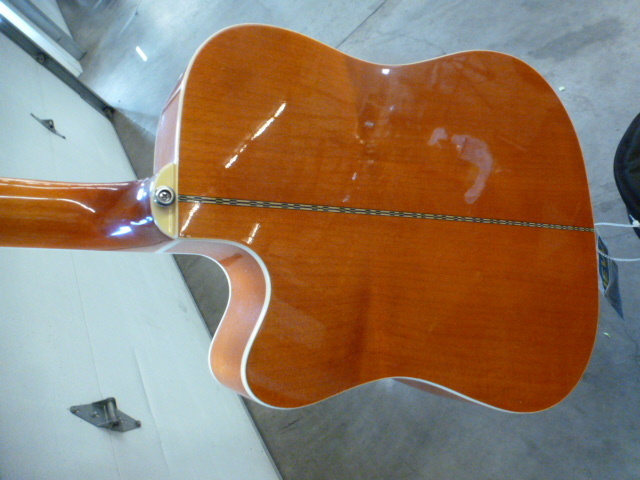 In terms of hardware, you are looking at a standard rosewood bridge that sports a compensated saddle. They’ve used quality materials for both the nut and the saddle we have just mentioned, ensuring that the intonation stays as flat as it possibly can. At the headstock, we have a set of pretty solid tuning machines. All combined, the hardware on this guitar gets the job done and is capable of keeping up with you even if you like to bend strings a lot. 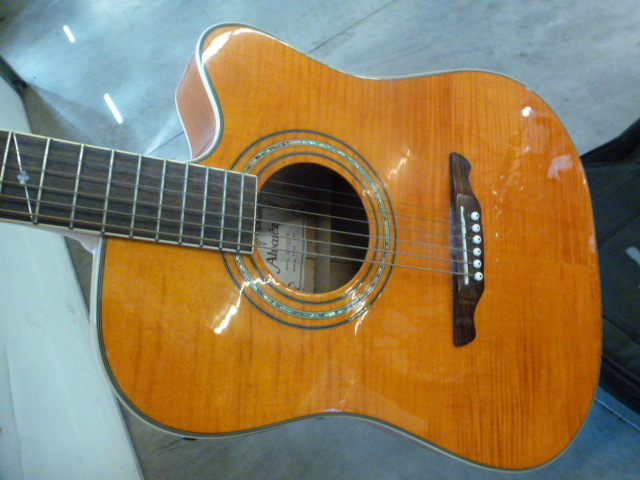 Alvarez FD-60 is an acoustic-electric guitar and hence features a preamp. 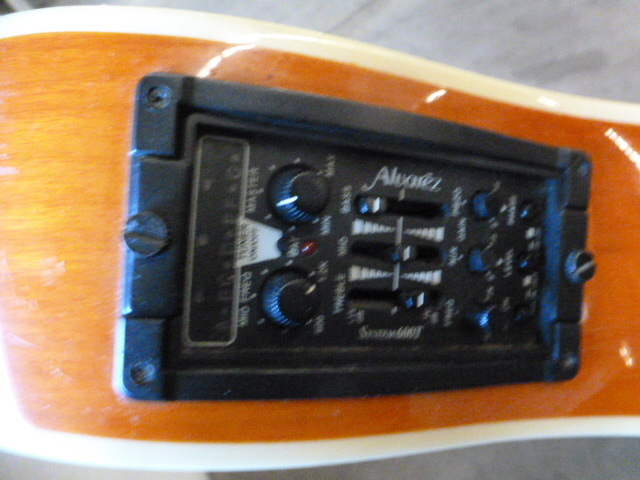 Alvarez went with the System 600T MkII set of electronics, which has shown to be a mighty configuration many times by now. The overall flexibility of this kit allows you to do a decent amount of tone shaping. 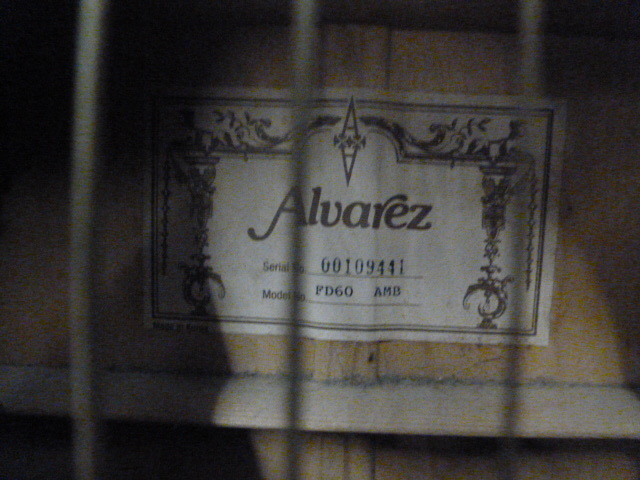 In terms of accuracy, we’d say that System 600T does a great job at rendering the natural tone of the Alvarez FD-60. You can easily cut through even the most saturated mix thanks to this preamp. Dreadnought shape is a telltale sign of great projection and volume. Alvarez FD-60 doesn’t differ from that one single bit. 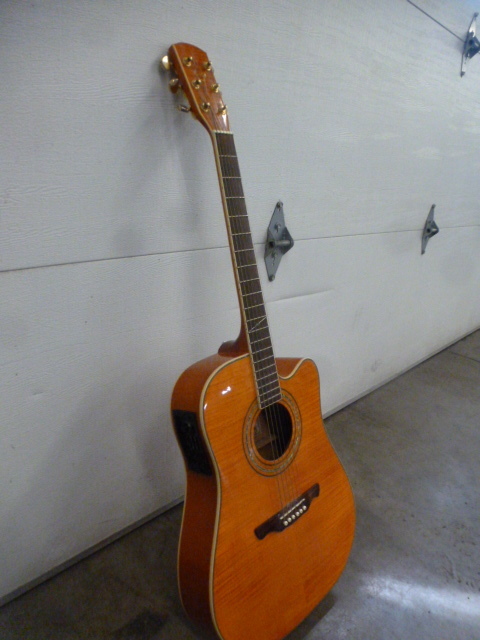 With its full maple build, you can expect to warm and soft tone that is perfect for finger picking. At least in the mid and low range. Once you reach trebles, the guitar will appear to be a bit brighter. Combined with the onboard preamp, this is a great sounding ax. If you are a working musician in search of a decent instrument that gets the job done but doesn’t cost a fortune, Alvarez FD-60 is something you should check out. 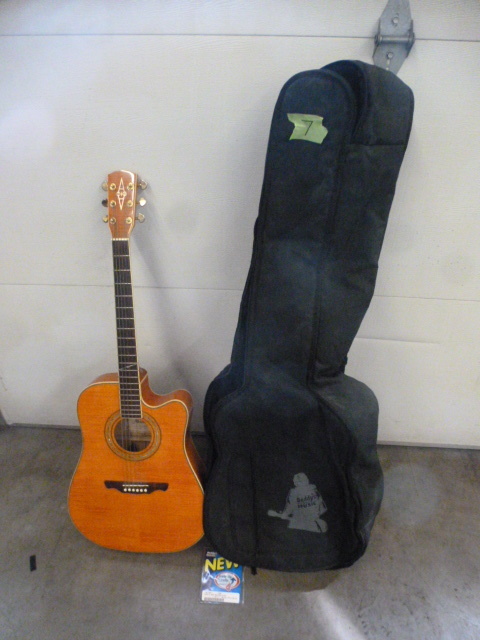 The guitar is well made, features great materials and components. In other words, it’s a master class dreadnought.